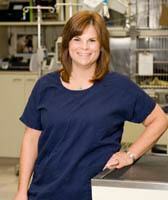 Why is a Licensed Veterinary Technician so important to the care your pet receives? What is an LVT? What does it take to become an LVT? Why is an LVT so important to the quality of care your pet receives? We hope to answer all of these questions here. An LVT is a Licensed Veterinary Technician. The best way to describe an LVT is as an RN for animals. An LVT does everything an RN does but on animals instead of people. An LVT is a person who has passed the state and national veterinary technician exam held by the Veterinary Board of Governors. In order to qualify to sit for the exams the person has to have either received a formal education (either a 2-year degree or a 4-year degree) in a Veterinary Technician program accredited by the AVMA (American Veterinary Medical Association) or has worked in a Veterinary Hospital for 5+ years and completed a very long, arduous list of skill assessments. LVTs can also be certified as specialist in a variety of areas of veterinary medicine including behavior, dentistry, and anesthesia. It used to be that LVTs were not as common in the clinic setting and a lot of clinics didn’t employ them because they did not see the need for someone so highly trained and skilled. However, in the last 20 years that perspective has significantly changed! With training in animal behavior, pharmacology, anatomy & physiology, surgical assisting and anesthesia (not to mention many other topics), LVTs are really the “right-hand man” of a veterinarian! It is also now the most difficult position to fill in a veterinary clinic because there are often not enough experienced LVTs looking for jobs. Having an LVT monitor your pet under anesthesia is incredibly important. An LVT knows the normal values for blood pressure, heart rate, respiratory rate, temperature, and blood gasses in both cats, dogs and a number of other species (yes, they are different). They also know how to adjust the amount of gas anesthetic that a patient is receiving to affect those values as needed during the procedure to keep them within health ranges for the pet. Sure, the veterinarian knows these things too, but wouldn’t you rather have your veterinarian completely focused on the surgical procedure rather than have their mind divided between the surgery and the anesthesia? Having an LVT monitor your pet while they are under anesthesia helps improve the health of your pet and helps to further reduce the risk of anesthetic complications. Veterinary assistants are often confused with LVTs. There are various training programs for veterinary assistants but the majority of them are trained on the job. Veterinary assistants also do not have to pass a board exam like LVTs do. Veterinary assistants do receive a great deal of training in animal behavior and various medical skills. The best way to describe a veterinary assistant is as a CNA for animals. They are very valuable members of the team and we couldn’t do this work without them. At Kitsap Veterinary Hospital, we take your pet’s health so seriously, that we have employed 4 LVTs and 4 veterinary assistants. 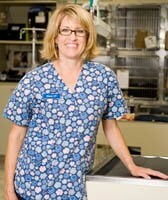 These team members work together to support our veterinarians in the care that we provide your pets each and every day! Every day we have one LVT who runs the lab and makes sure the rooms are running smoothly. We also have another LVT who is in charge of surgery each day. The two LVTs work in tandem to make sure that communication within the hospital is smooth and to ensure that each pet gets the full level of care that they require and deserve. If you would like to know more about our LVTs and what makes them so valuable, please let us know!